I thought about saying something like 'never go back to the canned Cream of Mushroom', but that doesn't even apply, because this is nowhere on a scale to being close to those AT ALL. This was just a pack of mushrooms at Costco that Martin and I decided to cook up on a chilly Holiday afternoon, that turned into a trip to heaven and back for me. I never would have dreamed that 20 minutes in front of the stove could have resulted into such perfection in a bowl. Call me wild and crazy(possibly annoying), but I couldn't stop "Mmmmm"ing the entire time. Creamy, rich, hearty, earthy, fresh, and light all at once. Make it. Adore it. Make it again. Step 1. Add butter and a couple glugs of olive oil to a medium pot, and bring to... bubbles:) add in your garlic, thyme, basil, parsley, bay leaves, Onion, and let saute on medium head till golden brown. Step 2. 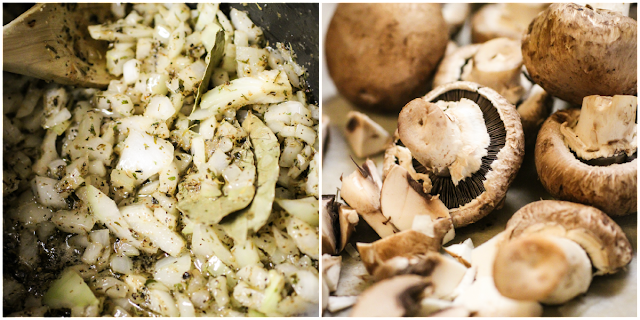 While the onions and spices toast, chop up your mushrooms into various shapes and sizes. Once the onions are done, throw your mushrooms and the Worcestershire Sauce into the pan and stir till the mushrooms are well coated. This is the pretty part huh? Add half your broth to the pan and bring to a boil for a few minutes. Step 3. Whisk your flour into your remaining stock (to avoid lumps), and add your mixture to the pot. bring to a boil again and cover for 10-12 minutes, shirring occasionally as it thickens. Step 4. Reduce heat to low, and add in salt, peppers, milk, and cream. 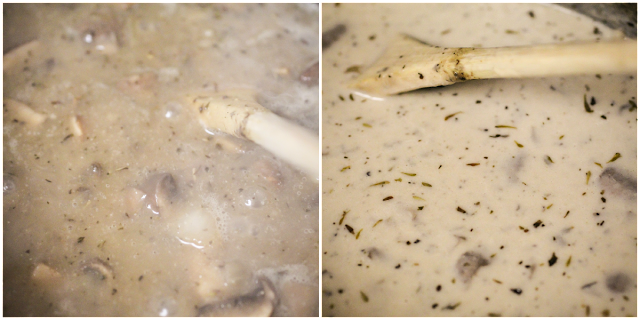 allow to simmer for just a few more minutes, being careful not to let boil! 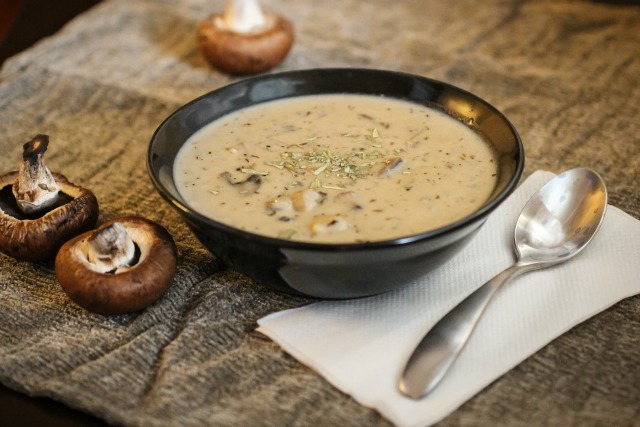 Serve immediately, and enjoy the most perfect bowl (or 3) of Cream of Mushroom Soup you've ever had. I just sprinkled a few dried spices on top for that extra flavor boost, but I've also held back a few slices of mushroom to saute in butter for a tender little topping. Its also prefect with some hot buttered toast on the side for a little crunch. 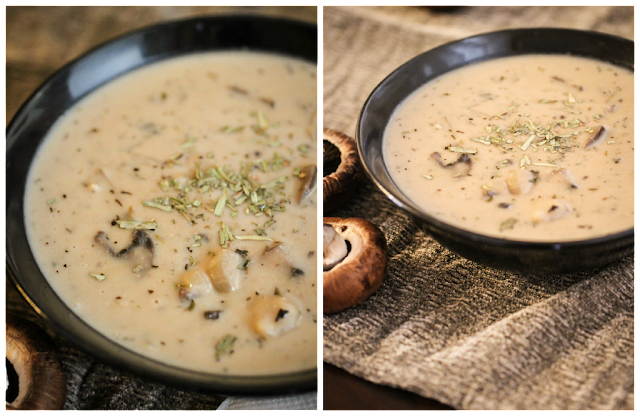 Seriously my favorite soup in the world people, and I thought I wasn't that fond of mushrooms! I really hope you give this a try, you will blow people away I promise. Let me know if you decide to give it a try, or if you have any questions, oh and feel free to Pin and save! This looks amazing! Perfect for the weather we are having here in Boston! I cannot wait to try this!! It's going on my menu. ASAP. Looks delicious! You have a great blog by the way! I am not a big fan of mushrooms, but that looks simply amazing. You had me at "1 stick of butter". I need to try this. I'm a soup girl. Ah- I am making this now and am either an idiot or can't figure out where to add the Worcestershire sauce?!?? I am at the add mushrooms step- so might just throwing in and see how it goes! Omg- this is fantastic. You are ight, I am humming to myself and my husband is looking at me as if I am nuts as we watch Downton! Thank you! I will make this again! I added the mushroom step in with the mushrooms, so thank you for letting me know! so sorry I left it out! So glad it turned out for you though, and so glad you liked it!! This is all kinds of yum! 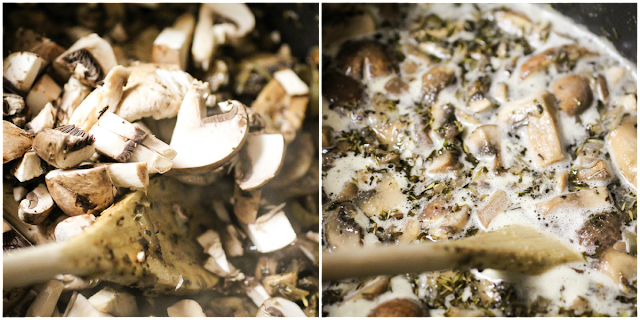 I make mushroom soup sometimes, though I’ll admit I fall back on cans for a lot of stuff like casseroles. Which leads me to the question: could this be canned? If it can be canned, then it would solve a lot of my problems! Little pint jars of mushy soup would be perfect for doing green bean casserole and for pouring into other soups and such! Where do you add the greek yogurt? I made this recipe last night and added the greek yogurt with the milk and cream. It came out perfectly, so I think all of the dairy was meant to go in together! I just made this and it was delish! Thanks for tonight's dinner recipe. 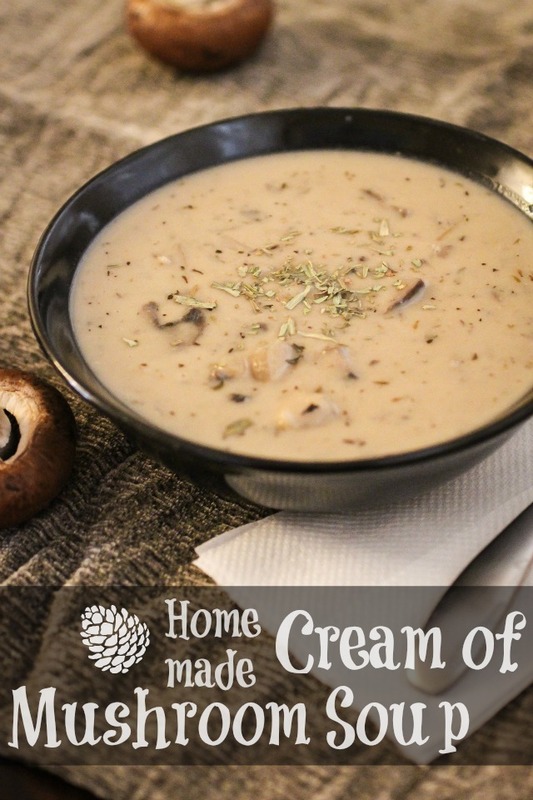 What’s the other mushroom soup recipe that isn’t the cream one ? Thanks !